For most people, going to bed at night is the highlight of their day. There’s nothing better than crawling under the covers and finally relaxing after a long day at work. However, if you’re a parent, then bedtime may be your least favorite time of the day because your children refuse to sleep. Being a parent is difficult enough on its own without having to struggle to find a quality infant or day care center for your little one. Luckily, if you live in Phoenix, then Valley Child Care & Learning Centers is here to help! We offer the high-quality early childhood education that you’re looking for, and our child care providers work hard to challenge your child in a fun learning environment. We offer infant, child, and preschool learning experience, as well as before- and after-school care. Would you like to learn more? Contact Valley Child Care & Learning Centers today to schedule a tour! In the meantime, continue reading below for a few tips that will help make nap time and bedtime a little easier. Both too much sleep and too little sleep can result in a child who is cranky and fussy come bedtime. If your child is not getting enough sleep, their bad behavior and defiance may be because they are overtired, whereas if they sleep too much, it may be due to the fact that they aren’t tired yet and simply don’t need to go to bed. Adults need approximately seven to eight hours of sleep each night, and it’s relatively easy for us to get the quality sleep that we need. However, children will need 12 to 14 hours of sleep if they are between the ages of 1 and 3, or they may need even more if they are younger. Knowing how much sleep your child needs to function and develop a healthy brain will allow you to schedule the right amount of naps throughout the day, and come up with a plan to help them get to bed at the right time each night. At Valley Child Care & Learning Centers, we understand that napping is an essential part of early childhood development. For this reason, nap time is a part of our daily routine. If you have any questions, be sure to contact one of our 10 locations! Kids thrive on a schedule, and the best way to avoid future battles over bedtime is to make it a routine. Instead of putting your kids to bed at different times each night, try to make each night the same as the last. For example, if your child goes to bed at 8 p.m., start having them get ready at 7 or 7:30, depending on whether or not they take a bath each night. This will help give your children a schedule that they can count on, and with time, you may even find that your kiddos start to get tired around the time that they usually go to bed. There are many reasons why your child should limit their time spent using electronic devices, and one of those reasons is that it can affect how easily they get to sleep. Watching TV or playing on a tablet right before bed can make your child feel more awake instead of helping their brain start to relax. Screens emit blue light, which can interfere with sleep patterns, making it more difficult for your little one to fall asleep and stay asleep. Instead of letting your child watch TV or play video games up until it’s time to begin their nightly routine, give them a certain time where they have to stop screen time and read a book or play a board game. At first, you may experience some push-back, but with enough time, your children will get used to the new routine and start to have an easier time going to bed at night. 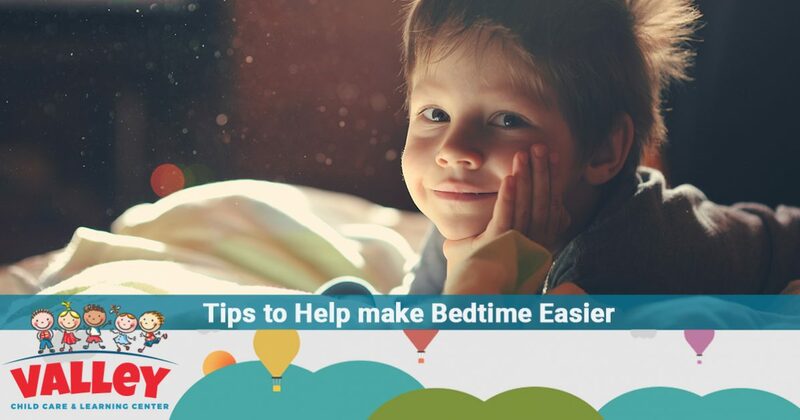 Finally nailing down a bedtime routine can be difficult, but at Valley Child Care & Learning Centers, you can count on our expert child care providers to give you advice on how to make the process a little easier. In addition to offering a quality early childhood education and extracurricular activities, we also make sure children are well-rested and fed throughout the day so that you never have anything to worry about. If you have any questions about our early childhood education programs, or you would like to learn more about our nutrition and safety policies, contact one of Valley Child Care & Learning Centers’ 10 locations in Phoenix, and schedule a tour today!